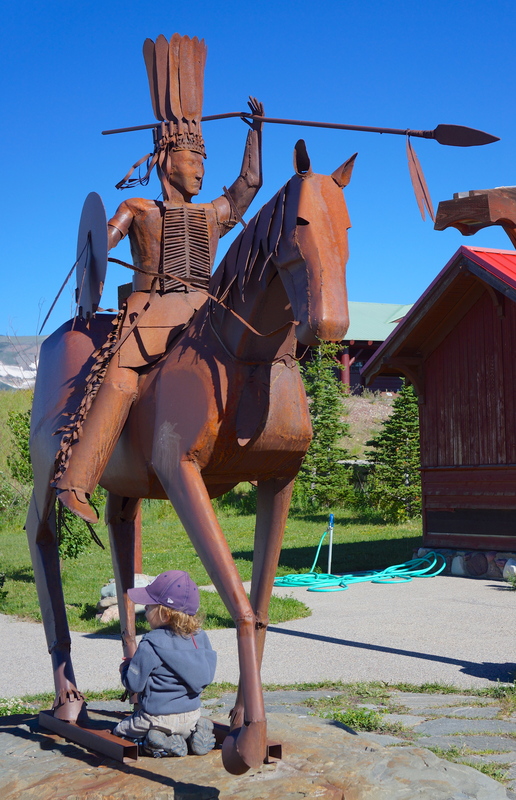 Monument at Entrance to Glacier National Park in East Glacier, MT (with young boy seeking shade). Breakfast at Glacier Village Restaurant in East Glacier, MT. 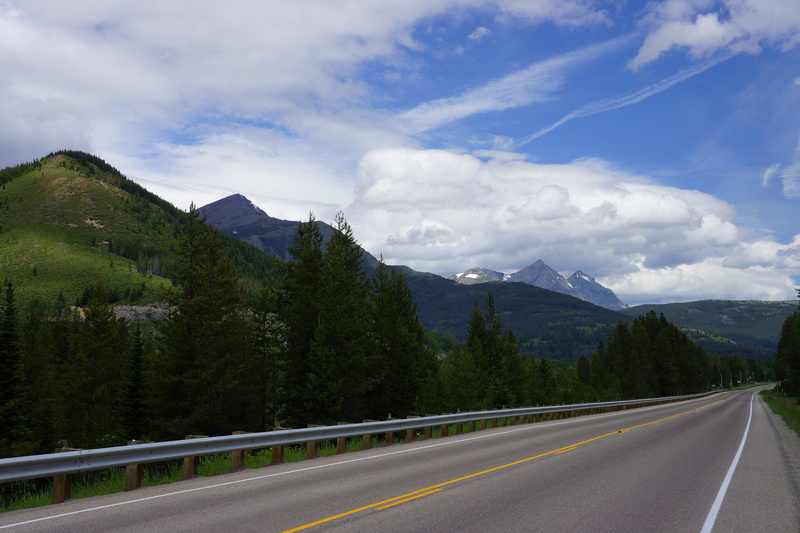 Mile 5 – View of Rocky Mountains after leaving East Glacier. 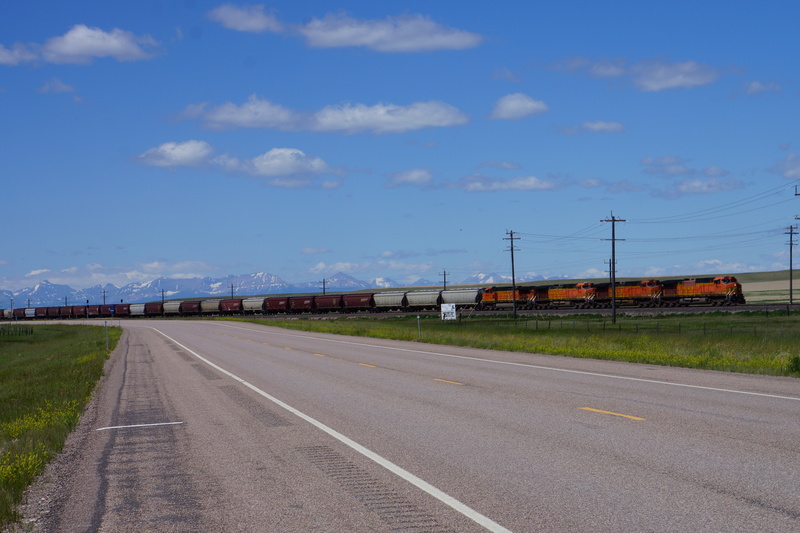 Mile 12 – Approaching Browning, MT. 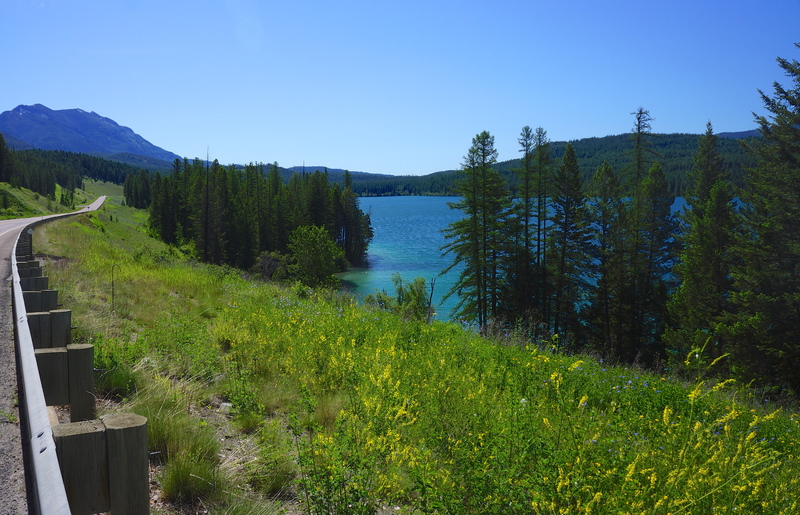 Mile 15 – View leaving Browning, MT. 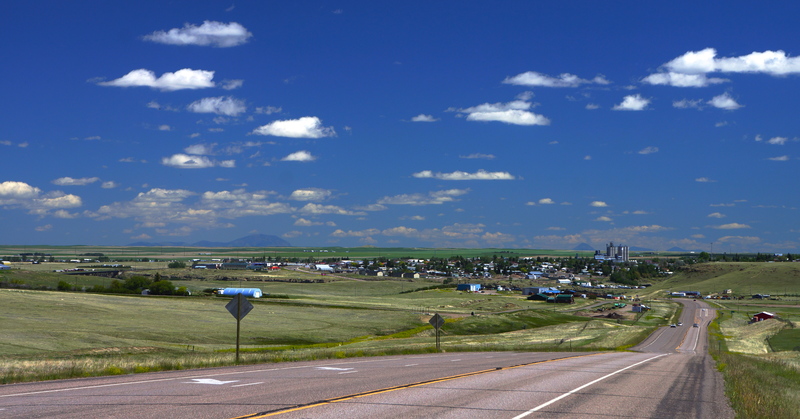 Mile 18 on Route 2 – Typical view of Plains after leaving East Glacier. 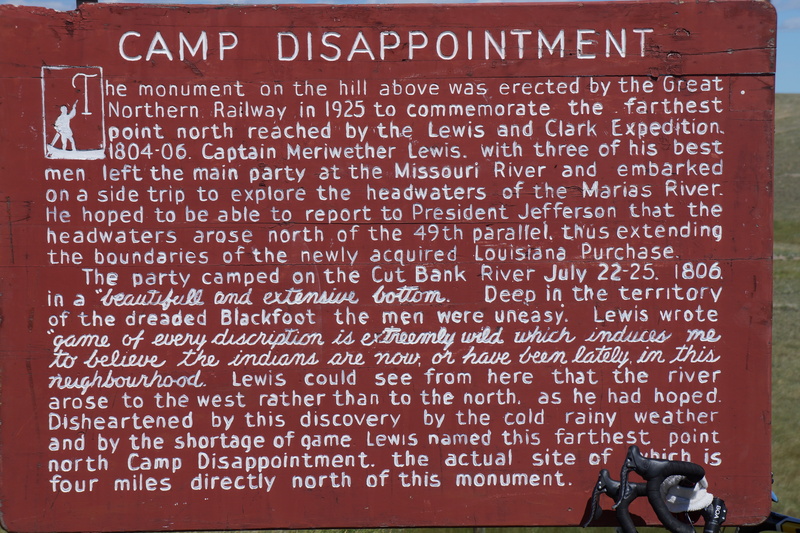 Mile 25 – Camp Disappointment (Lewis & Clark Expedition). 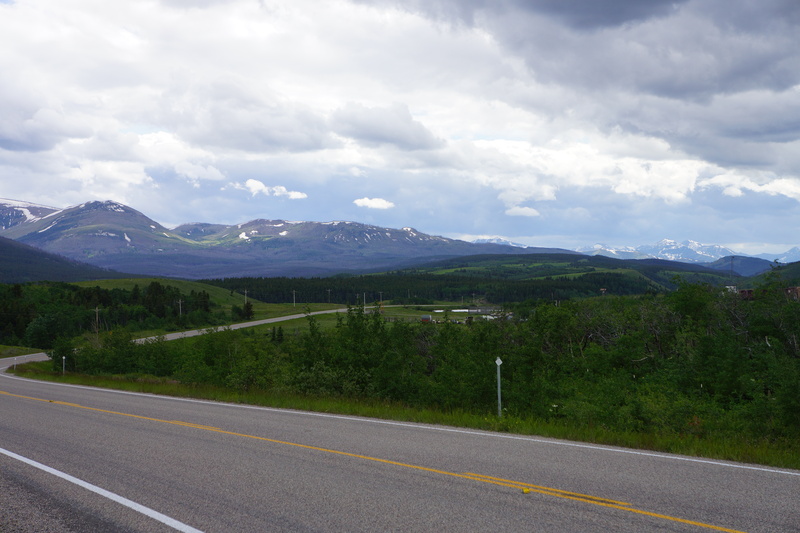 Mile 25 – Looking back at the road traveled and the Rocky Mountains. 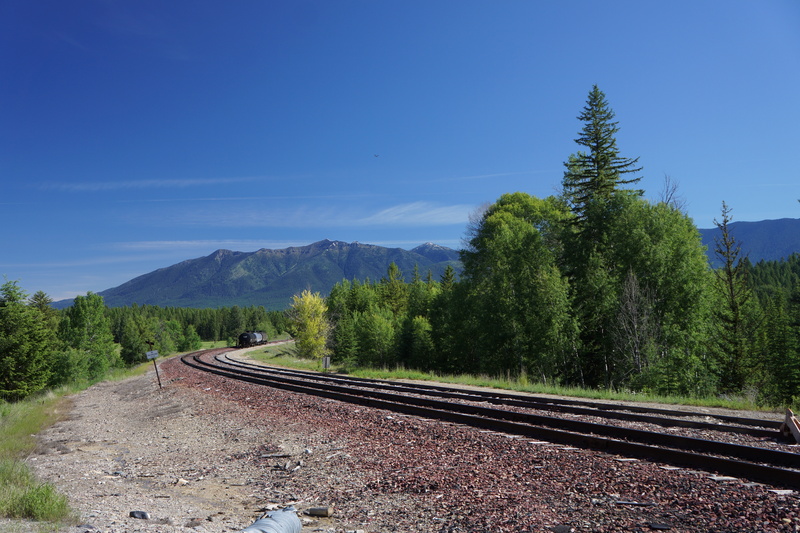 Mile 30 – One of the many trains each day that travel the same paths we do. 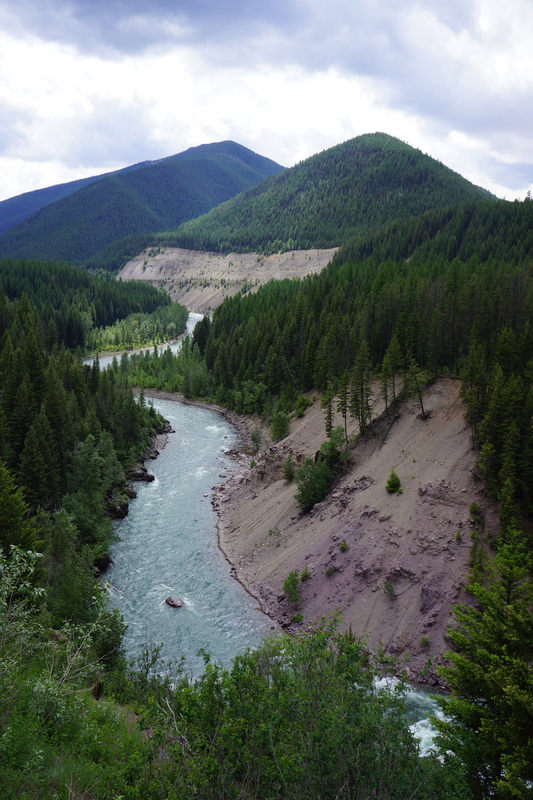 Mile 45 – Approaching Cut Bank, MT. 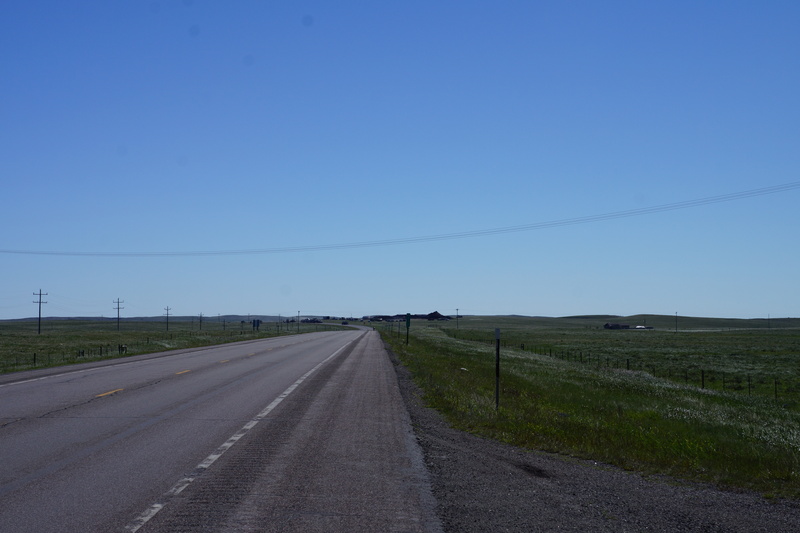 Mile 60 – The Plains between Cut Bank and Shelby, MT. Mile 5 looking West to East Glacier, MT and the Rockies. 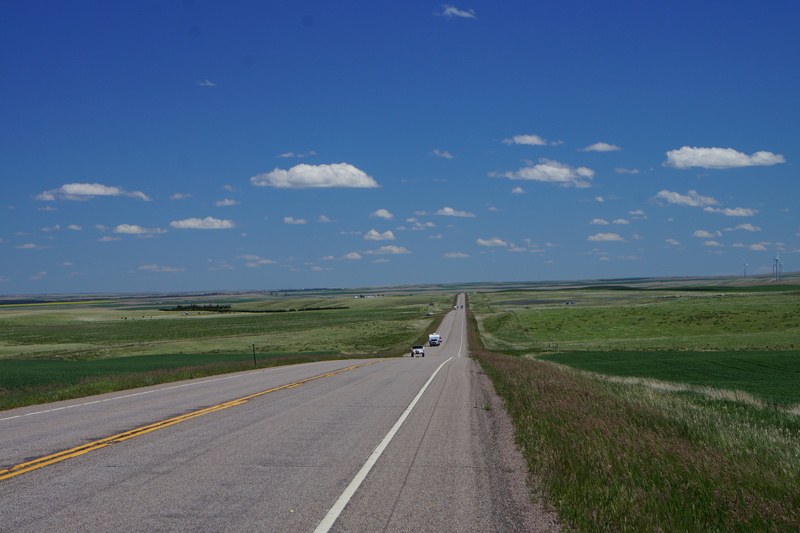 Mile 5 – Looking East to the Montana Plains. Finally a prefect day: All day sunshine, temperature mid 60s in the morning to low 80’s in the afternoon, beautiful, but different Montana scenery, moderate to low traffic, and wide unbroken shoulders (with some pebbles and rocks). Another new record for the trip besides hours of sunshine – My fastest speed of the trip (in fact, ever for distance), 16.7 mph for almost 70 miles. While I would like to claim it was my conditioning, it was greatly assisted by tailwinds and a 1,500 feet elevation drop over the 70 miles. To my frustration I had to catch a ride in a vehicle for 2 miles today. Route 2 was under construction with one passable lane for several miles and cars are led through the construction by a pilot vehicle. Typically, we have been allowed to skip the pilot driver and proceed through the construction. Today, I was stopped at the beginning of the construction and told that a grizzly bear and her cub were grazing near the construction area and that I would not be allowed to bike through for our own safety. The pilot vehicle (pickup truck) put my bike in the back and drove me the two miles. Unfortunately, the bear and her cub were gone by the time we reached the area. The change in scenery was dramatic today as we passed the Rockies and entered the Plains (see todays photos when posted). At mile 30 I passed acres and 100s of power windmills scattered over the Plains. Most of the area I biked today is in the Blackfeet Indian Reservation. Tomorrow will be the longest ride of the trip so far and our first century ride, about 111 miles. We are meeting for breakfast at 6:30 am and hope to be on the road by 7:30 am. Unfortunately the weather report is for rain in the PM as we approach Harve, MT (our second rest day). 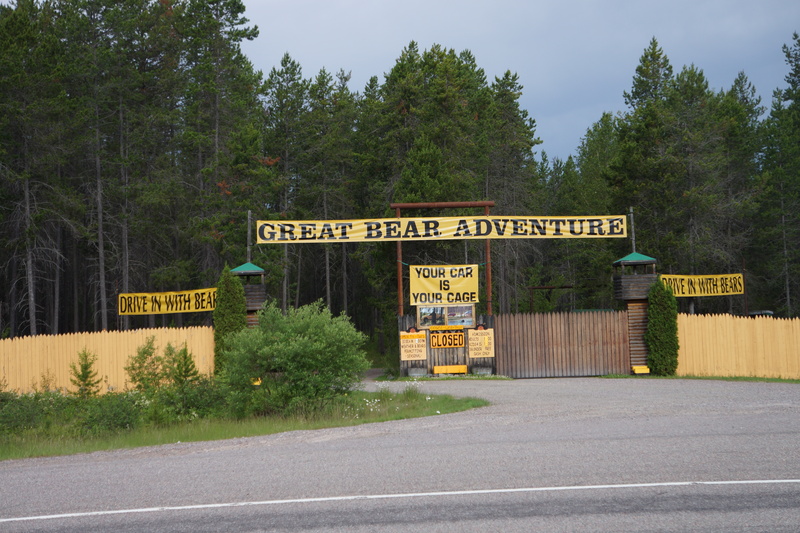 Mile 5 – Local tourist attraction outside Coumbia Falls, MT. 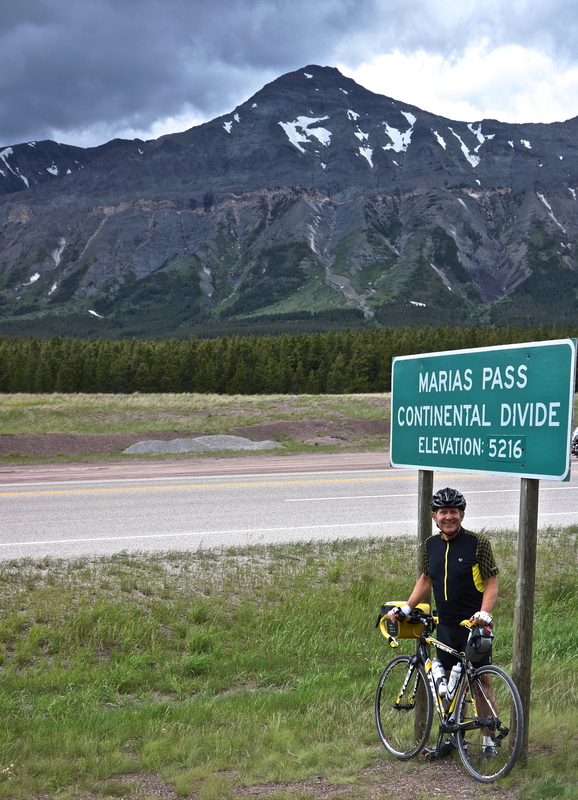 Mile 23 – John and Susan biking on Route 2 beginning the climb to the Continental Divide at Marias Pass. 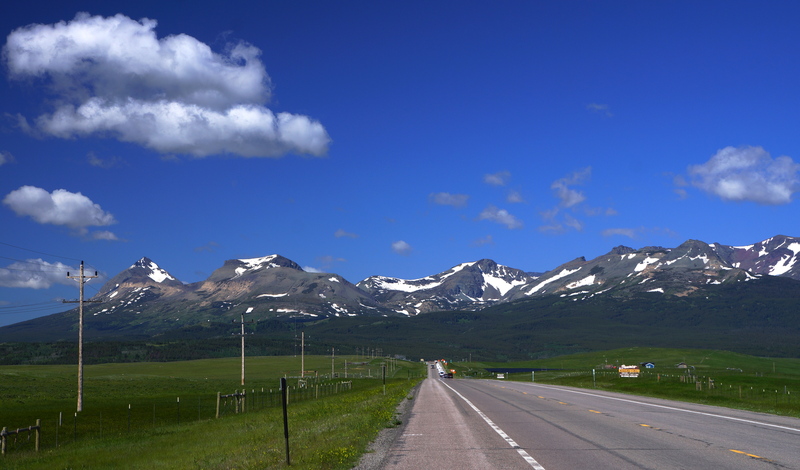 Mile 25 – View on Route 2 while climbing to Marias Pass over the Rockies. 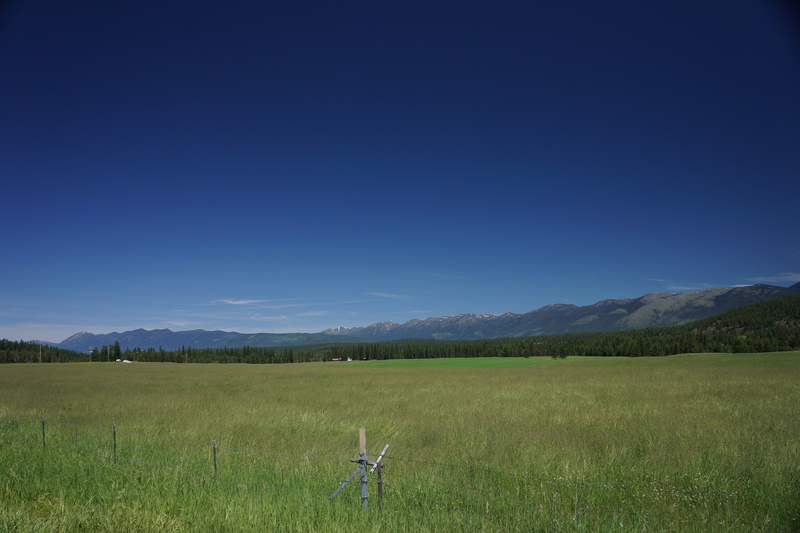 Mile 42 – View from Essex, MT on John and Susan riding Route 2 to Marias Pass and the Continental Divide. 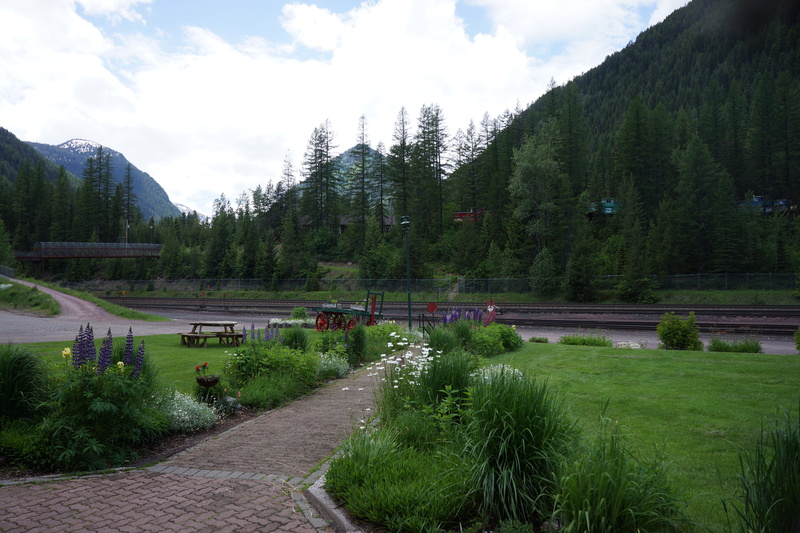 Mile 42 – Historic Izaak Walton Inn in Essex, MT (see June 29th post) where I had lunch on the climb to Marias Pass and Continental Divide. 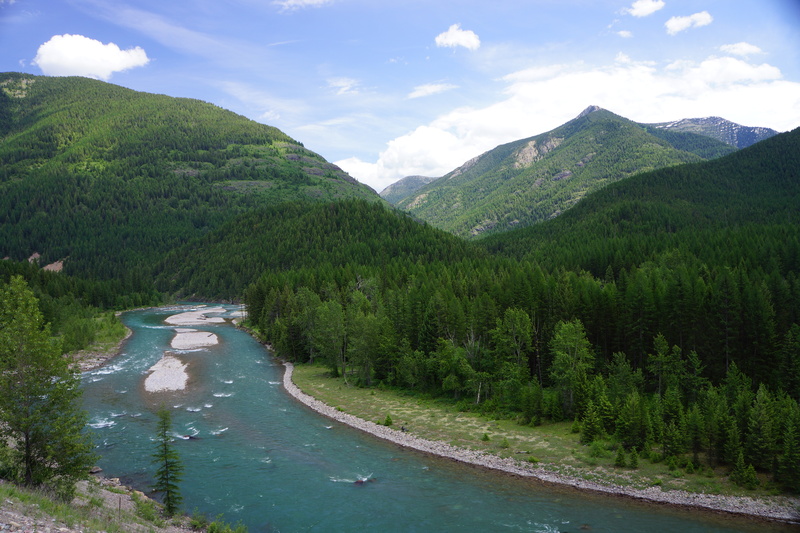 Mile 42 – View downstream of Middle Fork of the Flathead River near Essex, MT. 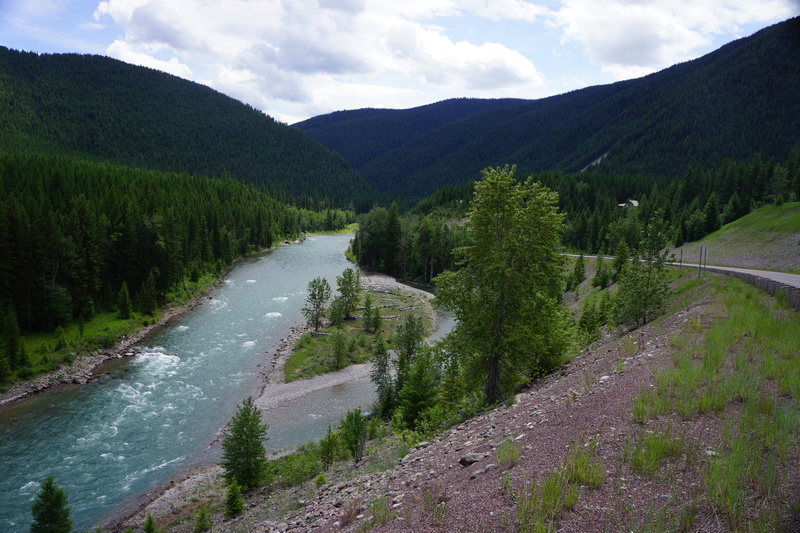 Mile 42 – View Upstream of Middle Fork of the Flathead River near Essex, MT. 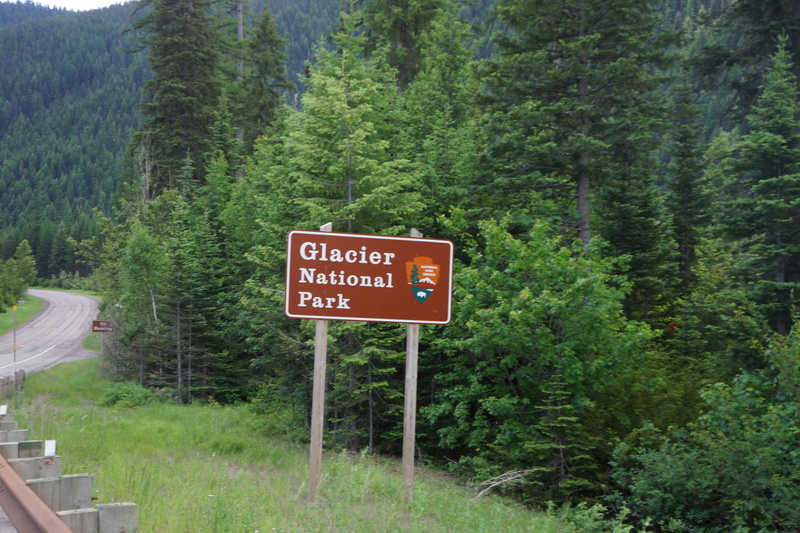 Mile 44 – Entering Glacier National Park beginning 17 mile continuous climb to Marias Pass and Continental Divide at 5,216 feet. 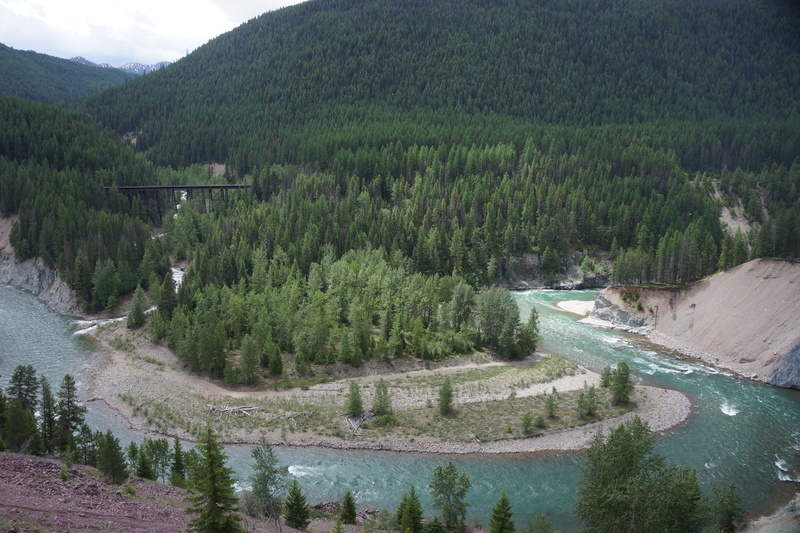 Mile 47 – View of Middle Fork of the Flathead River from Route 2. 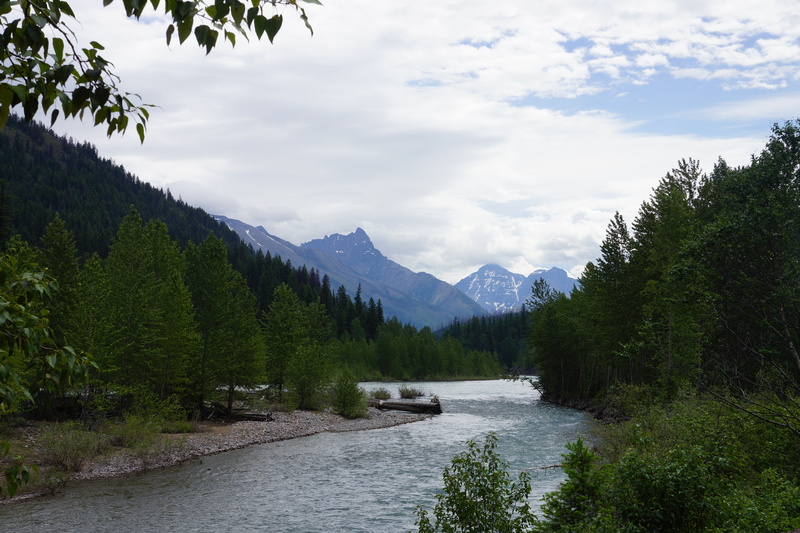 Mile 48 – Another view from Route 2 of the Middle Fork of the Flathead River in Glacier National Park. Mile 53 – Marias Pass only 6 miles further. 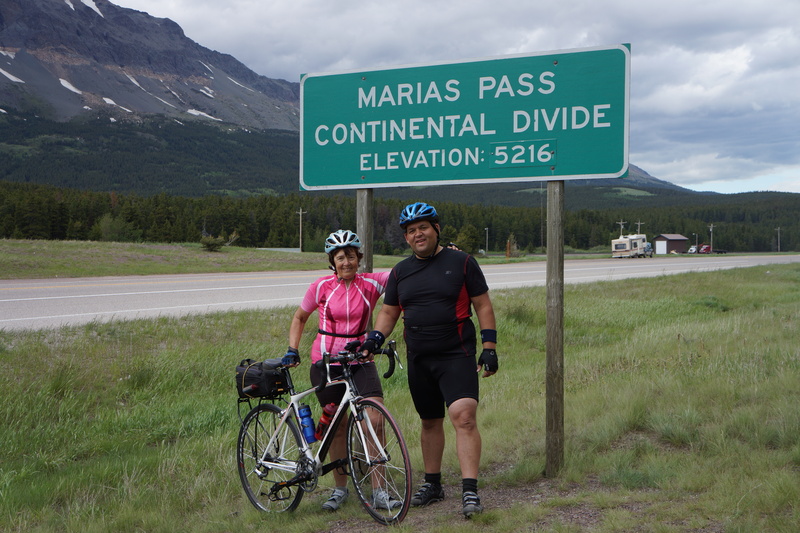 Diane and Nate Hart at Marias Pass/Continental Divide, 5,216 feet. 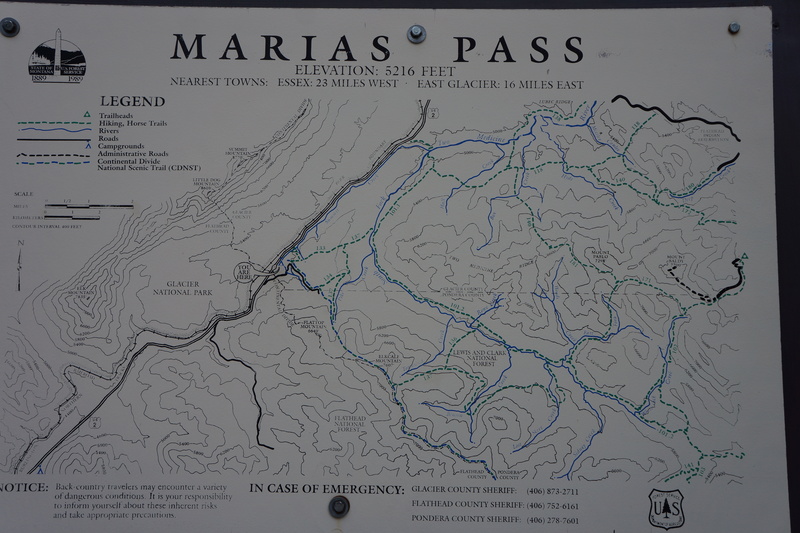 Mile 59 – Map of Marias Pass/Continental Divide. 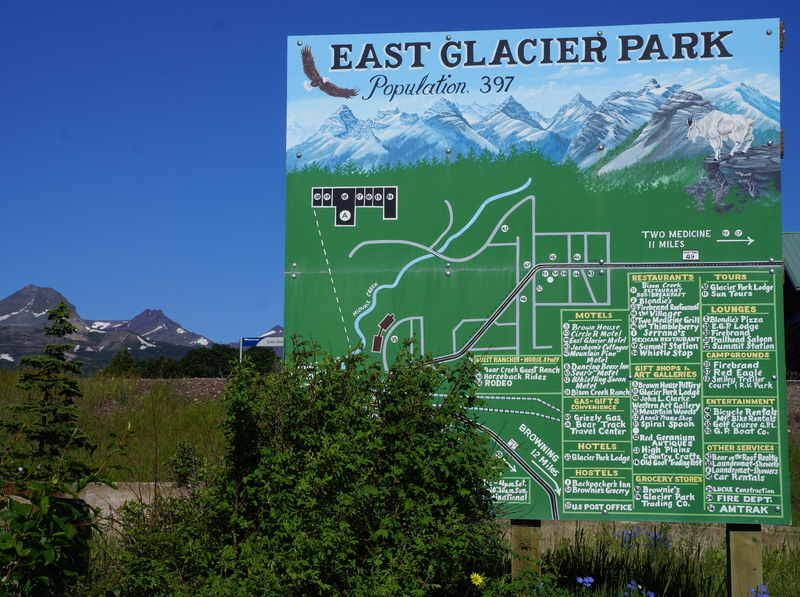 Mile 65 – Looking towards East Glacier as I descend from Marias Pass on Route 2. 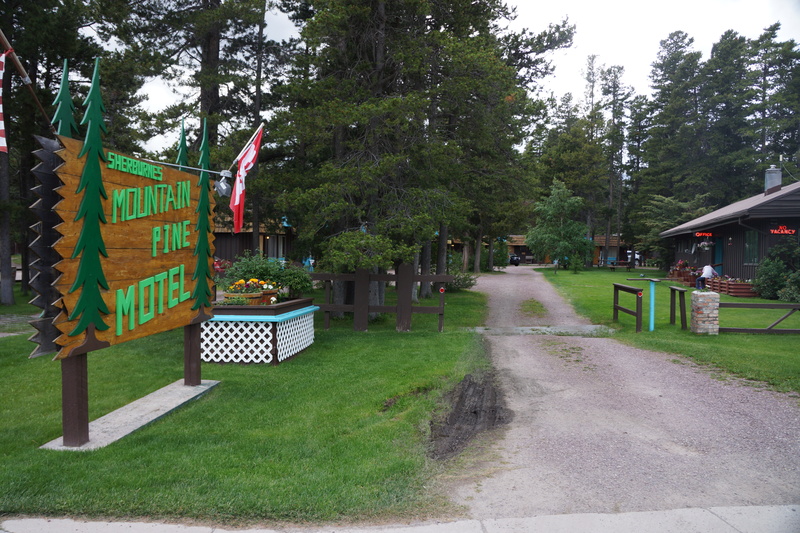 Mountain Pine Inn, East Glacier, Mt – Lodging night 13. 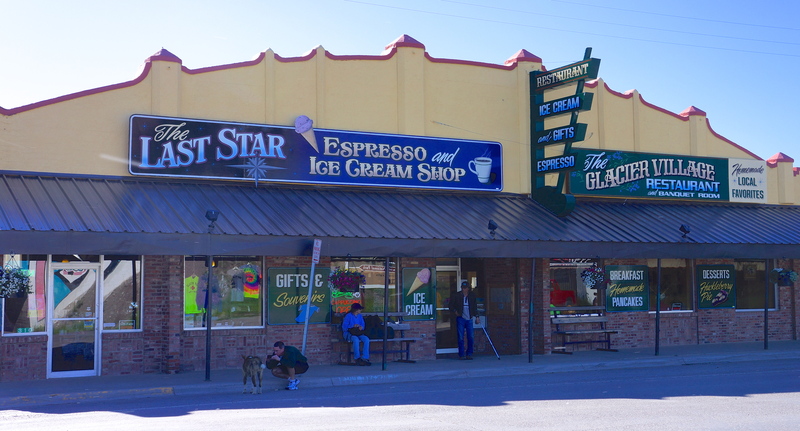 Ksanka Inn, Gas Station, Convenience Store, and Subway – Lodging in Eureka, MT. 4 Corners Restaurant & Casino (15 slot machines) in Eureka, MT – A great breakfast (and dinner the night before). Mile 9 – View along Old Highway/Tobacco Road. 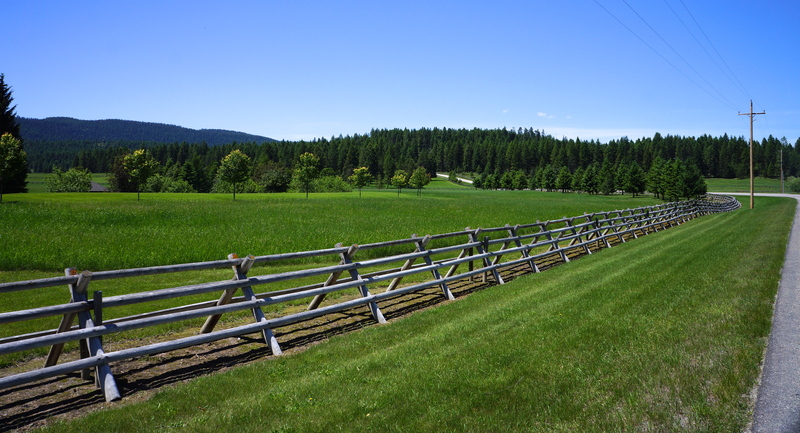 Mile 12 – Scene along Meadow Creek Road near Fortine, MT. 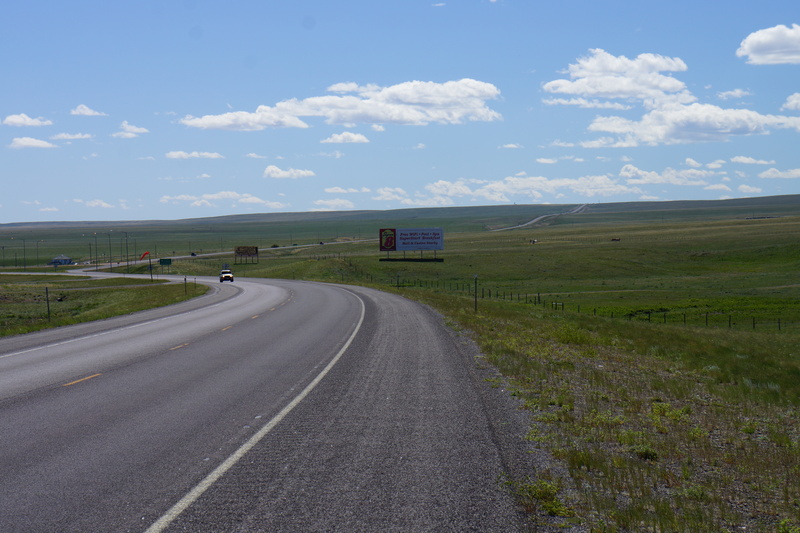 Mile 17 – Route 93 between Forline & Stryker, MT (before it became dangerous). 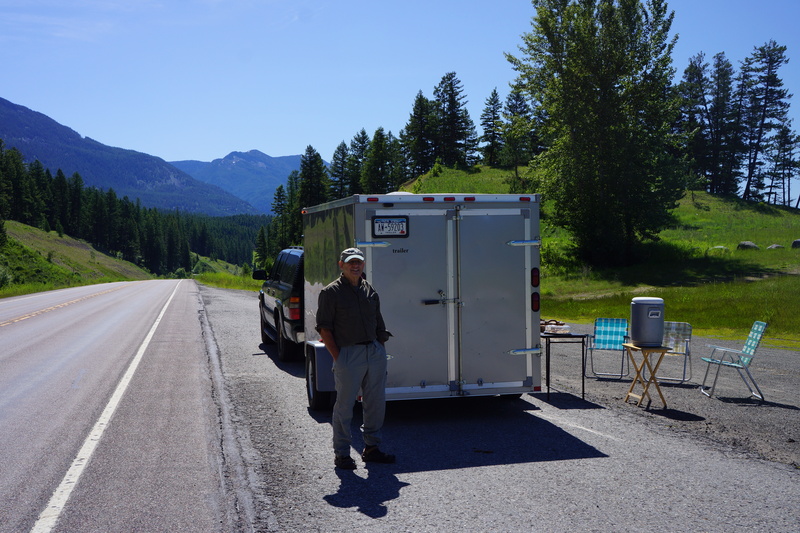 Mile 19 – Dale awaiting us with nourishment and a chair. 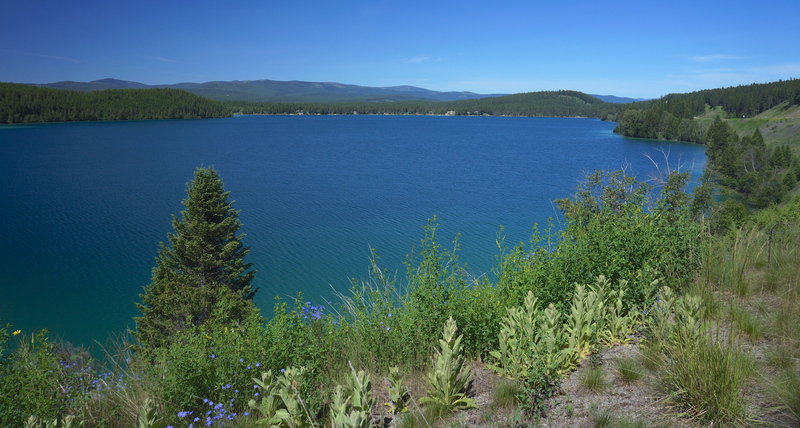 Mile 21 – Passing Dickey Lake. Mile 22 – Dickey Lake behind me. Mile 43 – Finally, relief from Route 93 on Farm to Market Road leading to……. Mile 50 – Another view from “Farm to Market Road”. 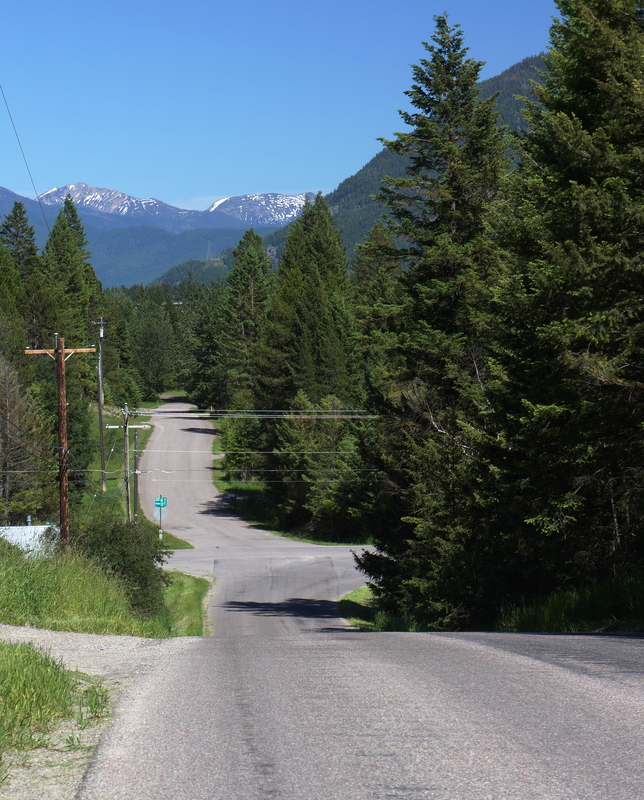 Mile 60 – Whitefish, MT, beautiful setting, stylish downtown, well-maintained homes (some Victorian) surround city center. Most importunity, no more riding on Route 93. 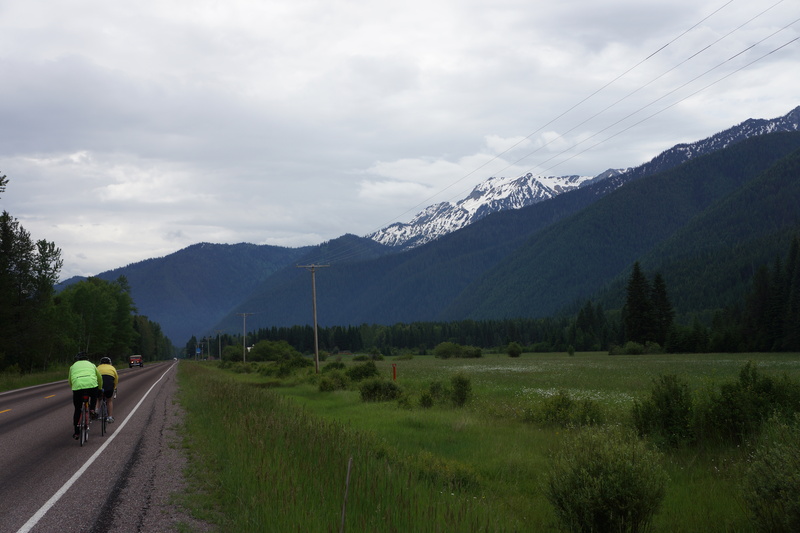 Mile 63 – Edgewood Road outside Whitefish, MT. 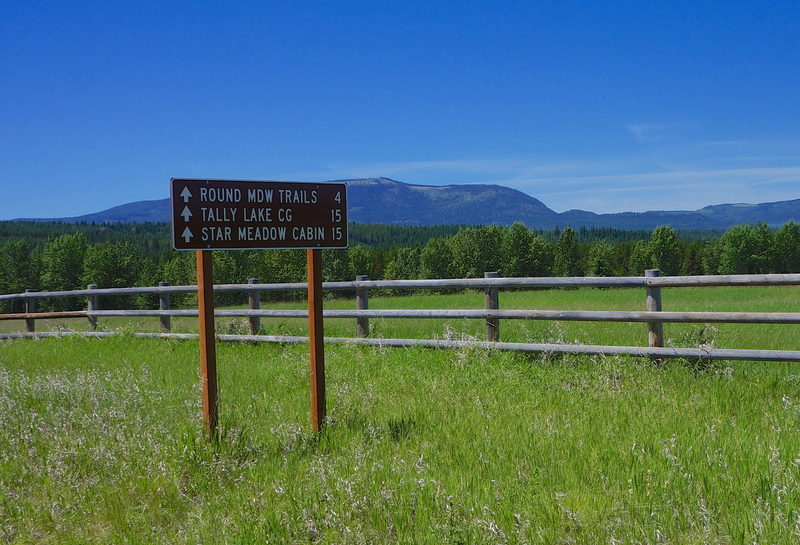 Mile 66 – Tamarack Lane near Columbia Falls, MT. Crossing the Continental Divide after a 63 mile climb of nearly 4,500 feet. After Nancy and I celebrated our anniversary on the telephone at 7 am PMT, today started with a lot of concerns – rain, a change in routing due to a muddy 3 mile section (thanks to Tom from Austin who was riding East to West and shared with me what he experienced yesterday), and 3 miles of road and traffic similar to the stressful ride yesterday on Route 93. Thankfully, for our long ride and climb today, the road improved after 3 miles and provided a wide shoulder, traffic diminished to a moderate level, and the rain stopped after an hour (even if we did not get much sunshine today). It stayed cool all day and only occasionally got above 60 degrees. But for climbing I was comfortable with shorts and a short sleeve jersey after the rain stopped. The only other exciting moment was when two dogs at mile 65 hid behind a bush to attack me until I was next to them – I made it unscathed. The challenge today was crossing the Continental Divide. Unfortunately, we did not get to ride the “Sun Road”. It is closed to cyclist between 11 am and 4 pm and adds over 100 miles to the ride which creates lodging and logistic problems. We took the “easy” alternative over Marias Pass, 5,216 feet, which we reached after 63 miles of riding from Columbia Falls. While the overcast diminished the visual impact of the mountains, it was still a stunning ride. Along the way I stopped for a great lunch at the Izaak Walton Inn in Essex, MT, a historically unique inn including six log cabins and six cabin cabooses and a diesel locomotive that has been converted into a luxury suite, They also have a collection of trains (full size) on display. Nancy – they also have 33 km of groomed cross-country trails in the winter and spring. We had a great dinner at the top rated restaurant (out of 9) in East Glacier, Serrano’s Mexican. It was packed and we were very fortunate that they were willing to seat us. I decided to walk to walk the 1/2 mile back to our inn after dinner. Along the way, I noted for the first time during the trip the overwhelming smells of the forest and mountains – mushrooms, pine, moss, and many others I could not name, but my wife Nancy could. It is still light a 9:30 pm, so I am very happy I decided to walk and experience the moment as my friend Shelley constantly remains me. Tomorrow is a very easy day, 70+ miles, mostly flat and downhill, so we aren’t going to meet for breakfast until 8 am and probably begin our ride until the late hour of 9 am. I am two days behind posting photographs (6/28 and 6/29) but hope to get caught up tomorrow when we arrive in Shelby, MT. Goodnight All. 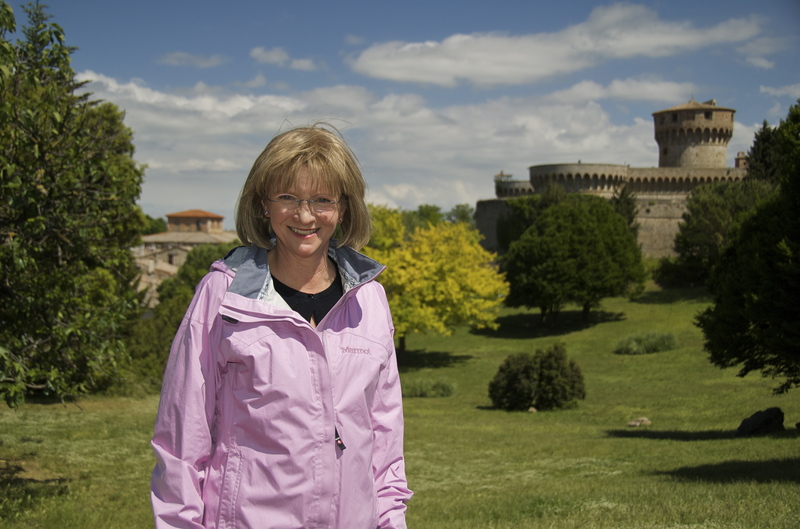 To My Beautiful Wife Nancy On Our 21st Anniversary Today – I Love And Miss You! Views on Old Highway/Tobacco Road 7 Miles From Euerka, MT. The bike ride today was nearly perfect except for one stressful issue. The great part of the day included: 1) Sunshine all day (regardless of the fact that is was 39 degrees when we had breakfast and only 45 when we started biking at 8:30 am – it did reach the 80s), 2) Continued beautiful scenery, 3) Light traffic on 22 miles of bucolic country roads (with some climbs over 10% reminiscent of Chester Country), 4) the city of Whitefish, and 5) dinner at the Three Forks Grille in Columbia Falls – the best meal of the trip so far (the Caesar Salad with smoked trout was outstanding). 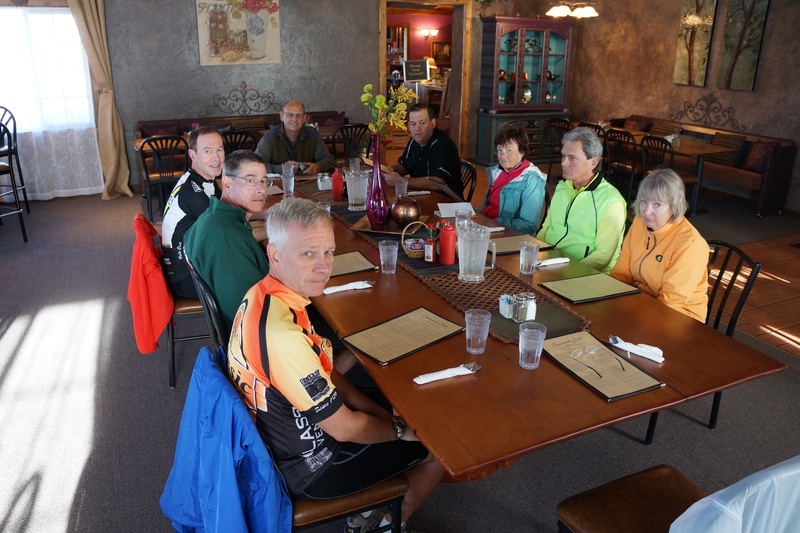 The bad, really bad, element of the day was 50 miles biking on Route 93 – lots of traffic, little or no shoulder on most of the 50 miles, uneven and broken pavement where I had to ride – overall terrible road conditions – a very stressful experience. 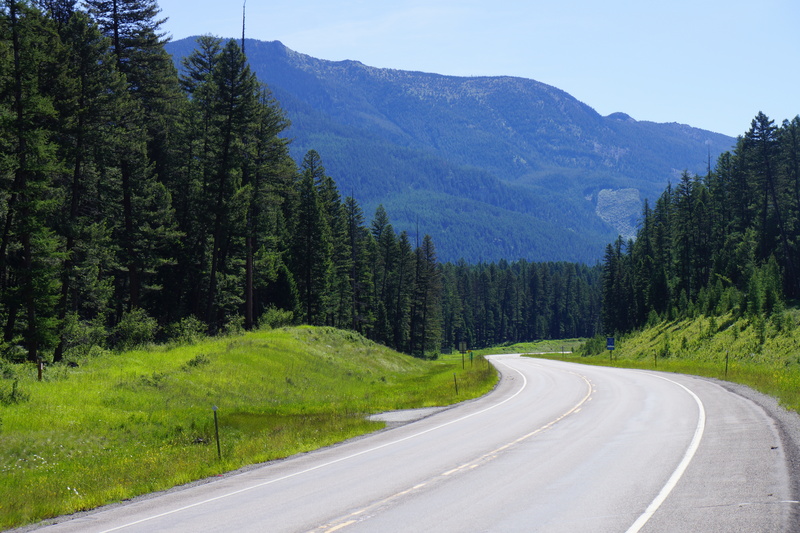 It was only at dinner that we were told by our waiter that Route 93 is the most dangerous road in Montana – certainly not a surprise. I had a scary moment when a logging truck came so close to me (even without on-coming traffic) that I was blown off the narrow shoulder into the dirt (I kept the bike upright). Unfortunately, we have one more similar road to ride in North Dakota (Williston to Minot with natural gas trucks) which we are going to revisit biking. 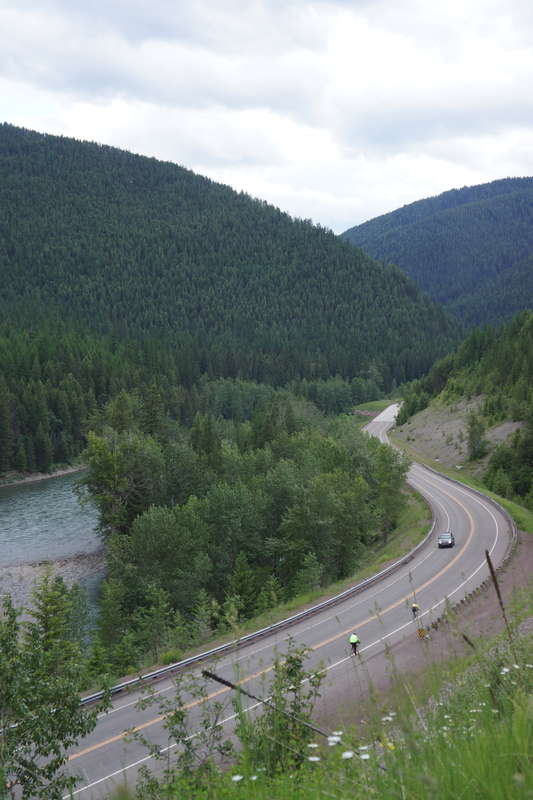 Tomorrow we cross the Rocky Mountains – our last major climb until we reach New York State.